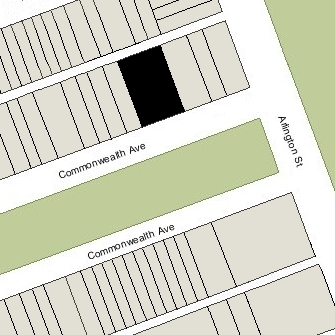 5 Commonwealth is located on the north side of Commonwealth, between Arlington and Berkeley, with 3 Commonwealth to the east and 7 Commonwealth to the west. 5 Commonwealth was built ca. 1861, one of a pair of academic brick houses (3-5 Commonwealth) built at the same time in a symmetrical design, each with a bay extending through the mansard roof. 3 Commonwealth was built on a lot with a 50 foot frontage, and 5 Commonwealth on a lot with an 80 foot frontage. The houses were about the same width, with 5 Commonwealth slightly larger and the western portion of the lot – about 20 feet wide — left open. Both houses included stables at the rear of the property. 5 Commonwealth was built as the home of cotton manufacturer and merchant Abbott Lawrence and his wife Harriette Story White (Paige) Lawrence. 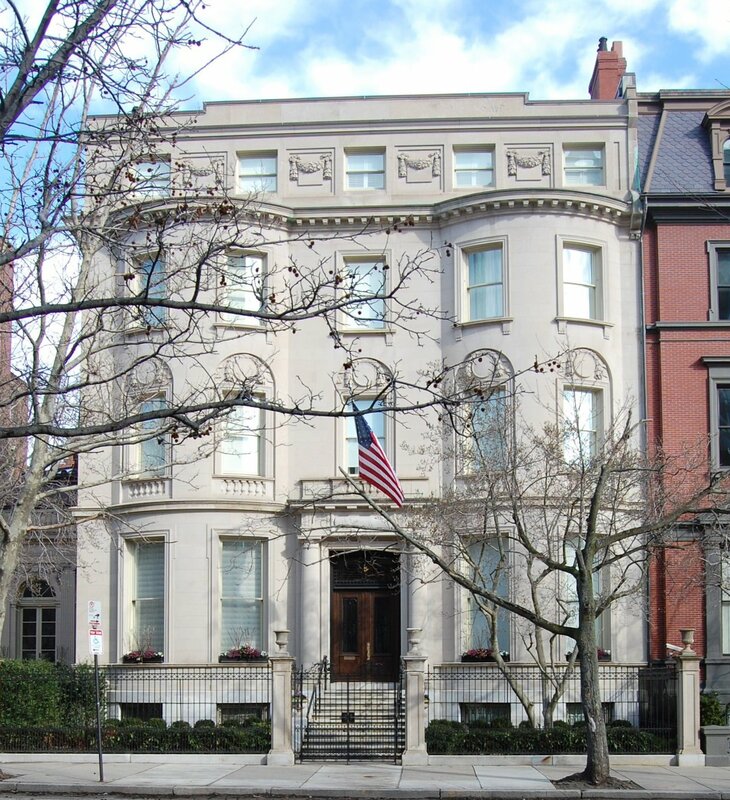 3 Commonwealth was built for his brother-in-law and sister, Benjamin Smith Rotch and Annie (Lawrence) Rotch. Both men purchased the land on which the houses were built from the Commonwealth of Massachusetts on May 2, 1860 (although Abbott Lawrence’s deed was not recorded until February 28, 1893, shortly before his death). The Lawrences previously had lived at 24 Summer and also maintained a home in Nahant. Click here for an index to the deeds for 5 Commonwealth. Abbott Lawrence died in July of 1893. Harriette Lawrence continued to live at 5 Commonwealth until her death in February of 1903. On April 15, 1903, 5 Commonwealth was purchased from Abbott Lawrence’s estate by Walter Cabot Baylies and Richard Middlecott Saltonstall, trustees under the will of George Phineas Upham. The house was purchased to be the home of Walter Baylies and his wife (George Upham’s daughter), Charlotte (Upham) Baylies. They previously had lived at 61 Commonwealth. They also maintained a home in Nahant and a home, Kippanwoods, in Taunton. Walter Baylies was a cotton broker and wholesale dry goods merchant, and an investor in and director of numerous electric and gas utility companies, textile mills, banks, and railroads. After buying 5 Commonwealth, Walter and Charlotte Baylies had it completely rebuilt. The new house was designed by architects Parker, Thomas, and Rice, and included a music room on the formerly open lot to the west of the house. The new house was completed in 1905. The music room was rebuilt and probably expanded in 1909, with the work designed by Parker, Thomas, and Rice. Architectural plans of the music room (dated May 1, 1909) — including elevations, floor plans, and foundation plans — are included in the City of Boston Blueprints Collection in the Boston Public Library’s Arts Department (reference BIN A-76). A November 11, 1973, Boston Globe article by Margaret Logan on the Baylies family and 5 Commonwealth indicates that the ballroom was completed In time for their daughter, Charlotte’s, debut in December of 1912. This is repeated in an interview with the Baylies’ grandson, Richard Schulze, quoted in the Boston Courant on December 1, 2007 (and again on March 6, 2009), indicating that the “grand ballroom was completed in 1912 for the debutante ball” for Charlotte Baylies. Inasmuch as the annex was completed in 1906 and appears on the 1908 Bromley map, and was rebuilt in 1909, the 1912 work was probably a major remodeling, perhaps converting the music room into a more formal ballroom. Living with Walter and Charlotte Baylies at 5 Commonwealth were their six children: Lincoln Baylies, who married in June of 1920 to Mary Beatrice Ballard, after which they moved to New York City, returning to Boston by 1922 to live briefly at 8 Gloucester and then at 315 Commonwealth; Charlotte Baylies, who married in May of 1918 to Dr. Randall Clifford, a physician, after which they moved to 636 Beacon; George Upham Baylies, who married November of 1933 to Jacquelyn Hartford, after which they moved to 323 Beacon; Walter Ray Baylies, who married in October of 1927 to Elizabeth Robinson Allen, after which they lived at the Baylies home in Taunton; Edmund Baylies, an unmarried actor, stage designer, and director, who lived at 5 Commonwealth and in Taunton when he was not in New York City; and Ruth Baylies, who married in February of 1933 to Ludwig Frederick Maria Schulze, after which they moved to New York. Walter Baylies died in May of 1936. 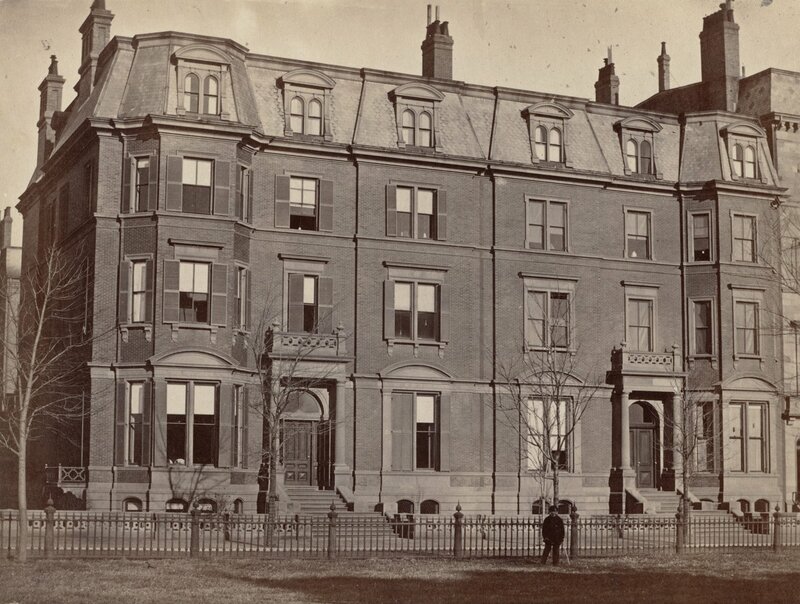 After his death, 5 Commonwealth was closed and Charlotte Baylies lived at the Ritz-Carlton Hotel during the winter and at their Taunton home in the summer. She died in April of 1939. On December 15, 1939, the estate of George P. Upham transferred the property to Ralph G. Coburn, an attorney, for the benefit of the Baylieses’ six children, and on March 1, 1940, they transferred the property to the New England Trust Company as trustees of the Baylies Real Estate Trust. On August 1, 1941, 5 Commonwealth was purchased from the Baylies Real Estate Trust by the Boston Center for Adult Education. 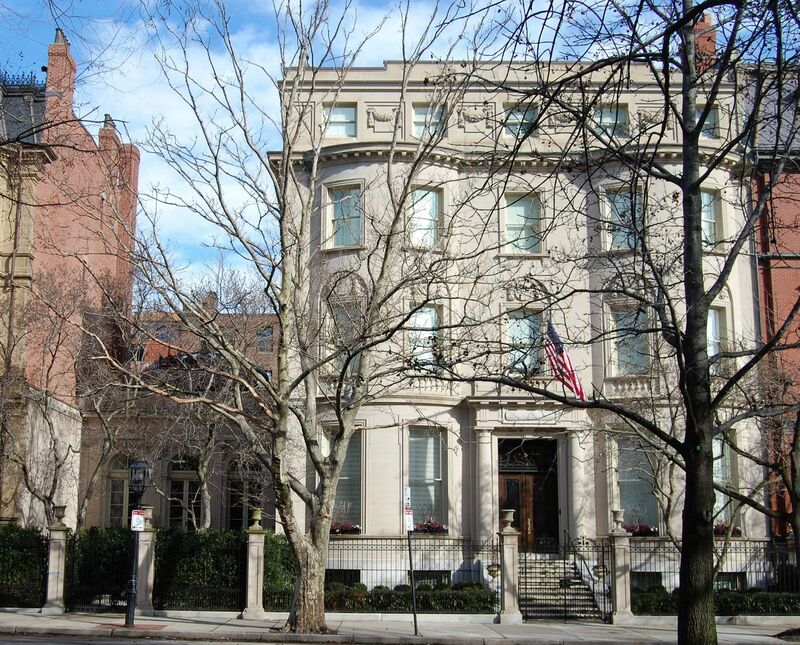 The BCAE continued to own and operate the building – renamed the Gamble Mansion in honor of benefactors Dr. Clarence and Sarah Merry (Bradley) Gamble – into the 21st century. On February 17, 2009, the BCAE sold 5 Commonwealth to the 5 Commonwealth Realty Trust. The BCAE moved to 112 Arlington and the new owner converted 5 Commonwealth back to a single-family dwelling. 5 Commonwealth remained a single-family dwelling in 2015.